We're clearly big on wearing green (organic cotton! ), but we never thought we could wear actual greenery. 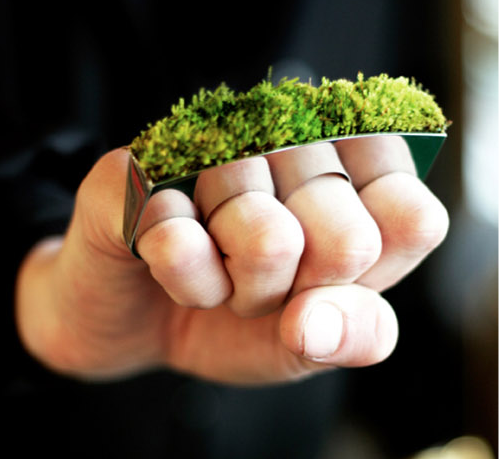 Icelandic industrial/interior designer Hafsteinn Juliusson has created a line of "growing jewelry" featuring live moss embedded in silver rings and necklaces, an "experiment in drawing nature toward man". 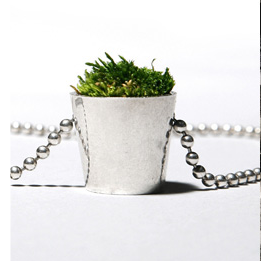 Provided that you water it every 5 weeks and freeze it when not wearing, the moss could stay green for 8 to 12 months. Definitely unusual and eye-catching, this line is available now at HAF by Hafsteinn Juliusson. Images from HAF. Via GreenMuze.